The 35-year-old singer received more than 40 stitches. She also broke her wrist and required surgery. After the accident, she told her fans she may look "a bit different." Underwood stopped posting clear photos of her face on social media and stayed out of the spotlight until this past weekend, when she made a comeback at the 2018 ACM Awards. 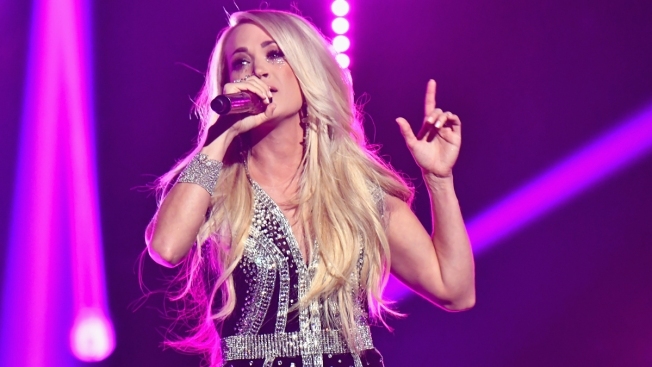 After she took to the stage to perform her new single, "Cry Pretty," fans remarked online that she does not look different at all. "For a while, I was worried he would be scared of me," Underwood said on "The Bobby Bones Show" podcast about her 3-year-old son, who she shares with husband Mike Fisher. "But now if I put makeup on, he's like, 'Mommy, your boo-boo's all gone.'" "I was clumsy and I tripped," she told Warren. "I held onto the dog leashes in my left hand and went to catch myself with my right and just missed the step. If I had fallen anywhere else, I would have been absolutely fine." She continued, "I thought I just busted my lip. Then I walked inside and took the dog leashes off and took my coat off and went to go survey the damage and was like, Oh, no!" she said, adding, "It wasn't pretty." The "Blown Away" singer said she also chipped a tooth but that mostly her skin was damaged. "I can't use my appendage and I'm trying to pick my kid up and make food and do mom stuff," said the singer, who now has a metal plate on her wrist. Amid her recovery, Underwood worked on her sixth studio album "Cry Pretty." The new record is set for release in September.